The framebuilding business is in vibrant health at the moment with lots of new builders producing frames. 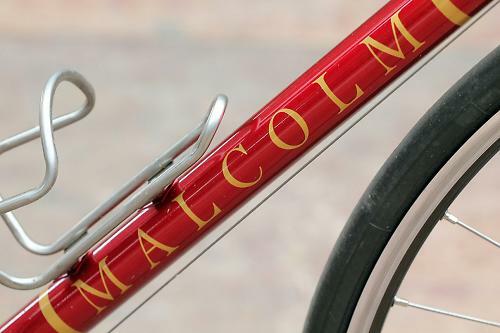 one of the newest is Malcolm Custom Bicycles, headed by ex-professional Australian cyclist Ashley Malcolm. 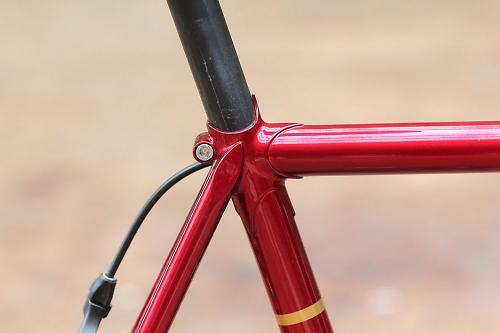 Now based in South East London and running Brockley Cycles, Ashley built his first frame in 2011, and is now starting to gain widespread appreciation in the custom framebuilding world. The decision to work in steel was an easy decision for Malcolm. He grew up in an era when steel was the frame material of choice, and his experience of having custom frames made as many racing cyclists did back in those days, has shaped the direction of his own framebuilding business. The frame is a thing of beauty, packed with elegant details. The head badge is a nice homage to Ashley’s racing roots, actually based on a photograph of him racing on the track. 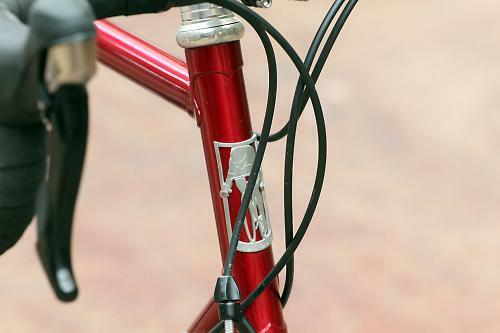 It’s made from pewter and is mounted to the head tube using either bifurcated rivets or stainless screws. The combination of the traditional geometry with a horizontal top tube, lugs and skinny steel fork give the frame a pleasing classic look that echoes some of the most beautiful steel frames from years gone by, such as the Colnago Master. 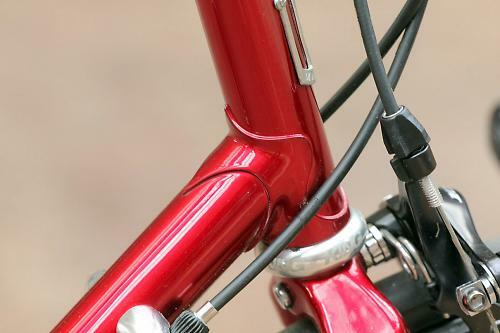 The cables are all routed externally but you can choose to have the rear brake routed inside the top tube if you prefer. The frame is very nicely finished, and the decals are subtle and pleasing to the eye. The beauty of a working with a framebuilder like Malcolm is that a frame can be built specifically to your dimensions and requirements and riding style. This frame measured up as a 56cm with parallel 73 degree seat and head angles, so it just happened to fit my quite nciely, and there was certainly nothing surprising in the handling department from those numbers. Of course, get a frame from Malcolm and it'll be built to the exact numbers you want so it'll fit you like a well tailored suit. The frame can also be built up with any parts you like, in this case it was a Shimano 105 groupset, Chris King headset, Deda stem and handlebar, both alloy, and a Madison Flux saddle. The wheels suitably match the frame, Shimano Ultegra hubs laced to Mavic Open Pro rims and shod with Continental Supersonic tyres, and handbuilt by Malcolm. Again, they'll build a frame to any specification you want, to suit your budget and riding style. So, the ride. In a word, it’s silky smooth and flawless over my regular roads. Even with the technological advances offered by aluminium and carbon fibre, a well designed and built steel frame still offers a fantastic ride quality that makes you wonder why you’d want to ride any other frame material. 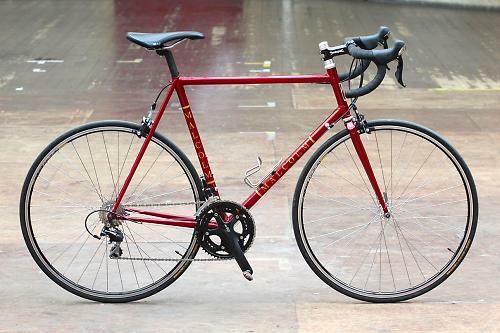 Granted, the traditional aesthetics of the Malcolm aren’t to everyone’s tastes, harking back to a bygone era of cycling when racers didn't wear helmets and jerseys were made from wool. But any notion that the bike is slow and ponderous are dispelled the moment you hit the road. The handling is sharp, the straight bladed fork producing very direct and fast steering. 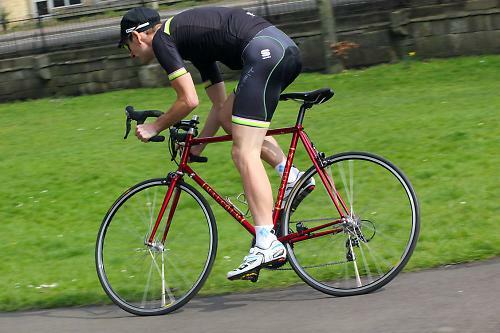 It’s an exciting bike to throw around the road, into corners and through sweeping descents. Yet it’s stable and composed when cruising along. 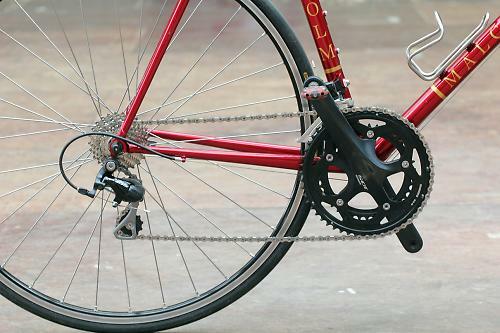 The steel frame and fork remain settled over rougher roads that usually have stiff carbon frames jolting offline. This poise and smoothness were the perfect match for my local Cotswolds lanes and roads. 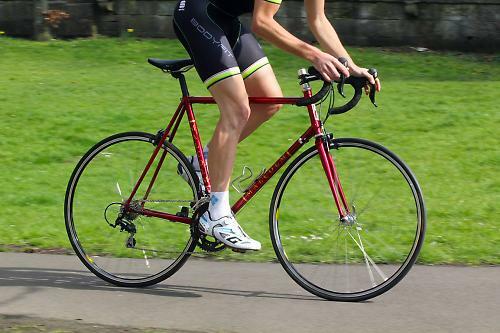 The short but often steep climbs handled with ease, the descents with grace and the more poorly maintained country lanes proved no problem, the frame and fork, plus the handbuilt wheels, providing a noticeable amount of forgiveness. My time on the Malcolm was all too brief, and even though the frame wasn’t built for me, the fit was good, and the ride impressions were favourable. I’m already a steel fan so don’t need any convincing of the materials worth, but riding the Malcolm was an exciting and thoroughly enjoyable experience.